"While a large percentage of contact centers have quality assurance (QA) programs to evaluate agent performance and the experience they deliver when handling calls, surprisingly, this activity is not performed in other channels such as email, text/SMS, online chat, or social media posts." "To improve the customer experience, engage agents and eliminate risk, enterprises should build omni-channel QA programs and implement them as soon as possible. 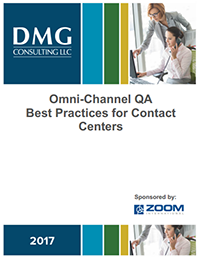 This white paper provides best practices to help companies build an effective omni-channel QA program for their contact centers." What is an Omni-Channel QA Program?